To show my appreciation for all of you out there, I made you a turkey. Enjoy, it’s a guilt free turkey with zero calories, it’s vegan and it won’t give you gas. Thank you all for stopping by. On a side note I managed to loosen up my painting a bit with this turkey. After the attempt with the bluebird post I had to take drastic measures. The secret technique I devised involved a bottle of Petite Sarah and while watching Dancing With the Stars. Please don’t tell anyone. No self-respecting Forester Artist should be caught doing such a thing. However, it did loosen up my brush! No turkeys were harmed in the making of this post. Sorry, I can’t say the same for dinner. 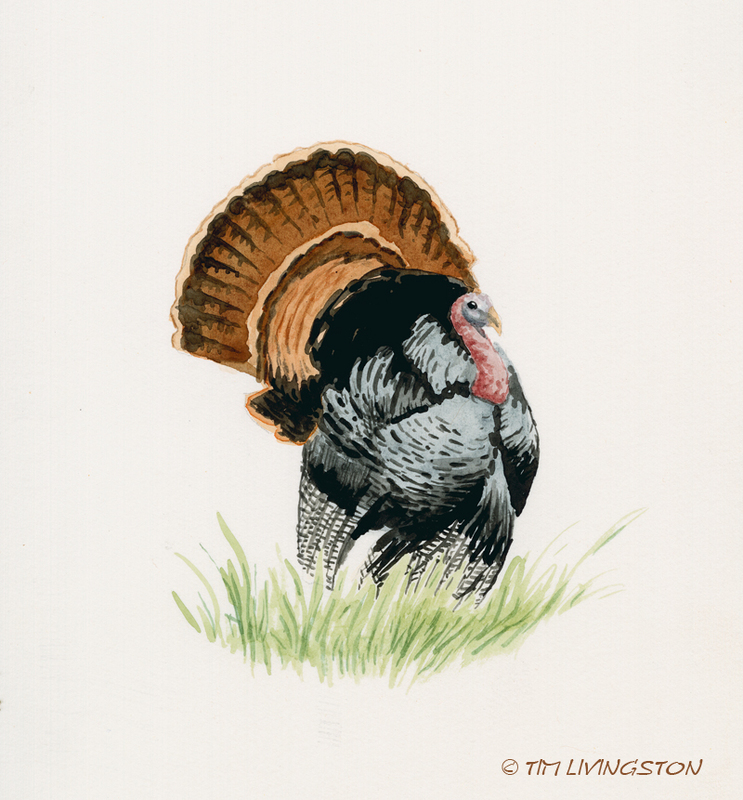 This entry was posted in Watercolors, Watercolour and tagged Forester Artist, nature, Thanksgiving, turkey, watercolor, watercolour, wild turkey, wildlife by foresterartist. Bookmark the permalink. I think he looks marvellous, Tim. Too good to eat. Thanks Don. I have pardoned him and now he can free range in my blog! As a vegan, I skip all those Thanksgiving menus that dominate the internet these days. However, I noticed the word ‘vegan’, so I opened your post to find a wonderful Turkey. Your Turkey is proud and safe. May he have a great life! Yes, this turkey is free to range through my blog as long as he wants! My guide picture for this watercolor was of a big old Tom from last Spring and he was strutting for a bunch of hens. Fun to watch. Indeed – too good to eat. 🙂 Wonderful job. Enjoy your dinner. This turkey is safe, but there is one that won’t be tonight. To help you save face with the fact dancing with the stars was on… I’m just going to blame the wine! Wine does have interesting effects on things =-O Ha! Thank you Ilex! Wine, yes it was the wine. I thought I was watching Axmen! You have a great Thanksgiving too. Happy Thanksgiving to you and Mary and the dogs too. Thank you Linda. We will and I am going to eat too much stuffing and gravy. I hope your Thanksgiving is awesome! lol You’re so funny, Tim! Thank you so much!! I will enjoy this Turkey. 🙂 May you and your family have a Blessed and HAPPY THANKSGIVING!!! Yes, well, sometimes you have to take one for the team! Love the vegan turkey which is a “feast for the eyes.” It’s a really good rendition of your talent. Thank you Yvonne and Happy Thanksgiving. I guess I’ll have to keep a bottle of Petite Sarah handy! Keep watching him Ralph and when he moves you let me know! Hmmm…he might have been pooping! I couldn’t agree more, and that is exactly what we had last night! My very favorite kind of turkey! Love it! Hope you shared a wonderful day with family. I’m a vegetarian so you made my day!!! I really like the painting too! Thank you, enjoy all you like! This is my favorite turkey I’ve ever received! Ted won’t eat it and it won’t stink up the place after a week! I love your sense of humor. Thanks for painting and sharing the turkey picture. You are a wonderful artist.